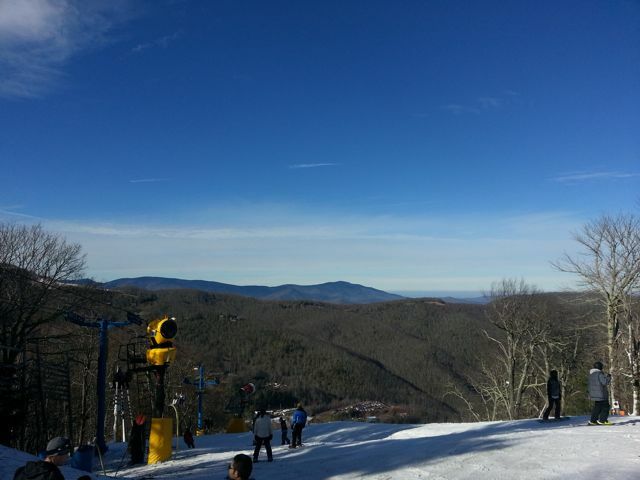 Skiing in the North Carolina Smoky Mountains doesn’t compare to skiing in B.C.. But when you live in Atlanta, $125 for the equipment rental, lift ticket, transportation, hotel and two meals is hard to beat. Granted, that price was that low because I went with a group of 40 people, and the January weather was so warm that all the snow was man-made, but that’s ok. I had fun. My trip was a small adventure that took me to the Catalahooche Ski area, about 3 hours north of Atlanta. I met a lot of interesting people, including two C-17 mechanics from the USAF. A C-17 is a massive military transport aircraft. “The British and Canadians have them, too”, one of them said proudly. He’s right. If you’re following the news, you may have seen that Canada sent a C-17 over to Mali recently. I met a lot of friendly people. A group of 5 and 6 graders invited me to ski with them. Most of them fell down less often than I did, but they’re smaller and closer to the ground, so I don’t think that’s a fair comparison. Someone from the south asked me if I had made igloos when I was growing up in Canada. To be completely honest, I wasn’t sure how they were made until I got home and found a lovely 1949 NFB documentary, How to Build an Igloo. Now I want to fly back to Canada to make an igloo. Though part of this inspiration is from a recent article I read about a guy from Edmonton recently built a pretty rainbow igloo not long ago. I took a few photos from my trip using my cell, below is one of them.